.Paying for education is never easy. Some families and employers cover the costs, but not everybody is so fortunate. If you need to come up with more money, you’ll need to know how to get a student loan. This page covers the options available to you, and what you need to know before you borrow. The choices above are more or less in order of affordability. Student loans from government sources are probably your best bet. These loans will generally have lower interest rates, and some of the interest may be paid (subsidized) on your behalf while you’re in school. There are several other benefits to government-backed loans, which you can read about here: Advantages of Federal Student Loans. The drawback of government programs is that they may not cover all of your expenses. There are limits on how much you can borrow, and if you need more you’ll have to find it elsewhere. To get a student loan as part of a government program, visit your school’s financial aid office. Let them know that you’d like to borrow, and they’ll tell you what steps to take. You’ll have to fill out a FAFSA form, which will determine what type of aid you’re eligible for. To complete the FAFSA, you'll need to provide details about your finances: your assets in bank and investment accounts, income levels, Social Security Numbers, and so on (for both you and your parents). After your FAFSA is processed, you'll get a financial aid offer from your school. You can accept the offer, or pass if you've decided to take another route. 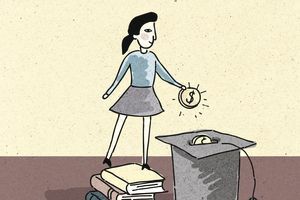 If you decide to accept the funds, you'll need to complete entrance counseling (a relatively brief training on how your student debt works), and sign a loan agreement. As you apply for loans, remember that you’ll have to repay them someday. Run some numbers to understand what you’re getting yourself into -- before you pull the trigger on getting a loan. Plug your loan details into a loan amortization calculator, and see how much you’ll have to pay each month, and how much you’ll pay in interest over the life of your loan. This is an important part of your education. You should be able to qualify for certain government loan programs regardless of your income or credit score. However, if you need more money, you’ll have to qualify for loans with private lenders. That means you’ll need debt to income ratios and credit scores that are high enough to borrow more -- and students frequently don’t meet those criteria (because they're generally young, just starting in the work world, and haven't yet built a credit history).